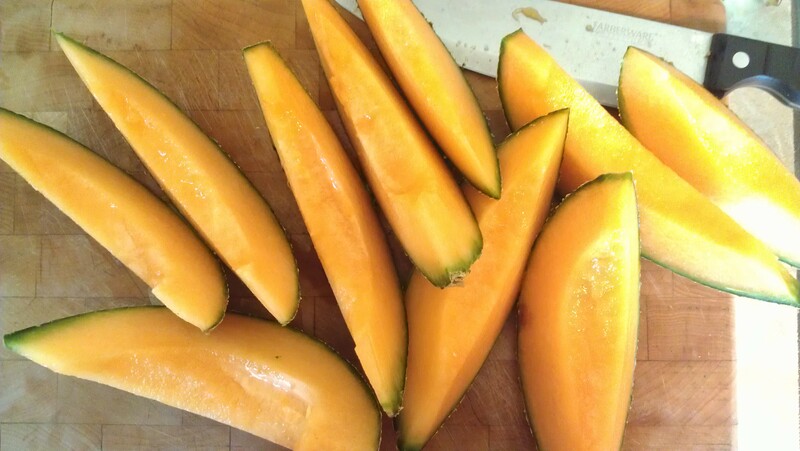 Growing Cantaloupes in Zone 5, a happy accident | Cooking Ripe! I have been so focused on writing about cooking with the harvest, I have been ignoring the other part of the story: the garden. It’s Fall now and the leaves are changing and the temps are dipping to the low 40’s and high 30’s at night, so the garden production is slowing and it’s time to finish the harvest and start planning for next year. One crop the Hubs insists we do again next year are cantaloupes. I didn’t plan them – or plant them – this year, but we grew them. Divine intervention? Sort of. Apparently last Fall or winter when I was in “lazy composting” mode I must have thrown the remains of a cantaloupe out into the garden area. 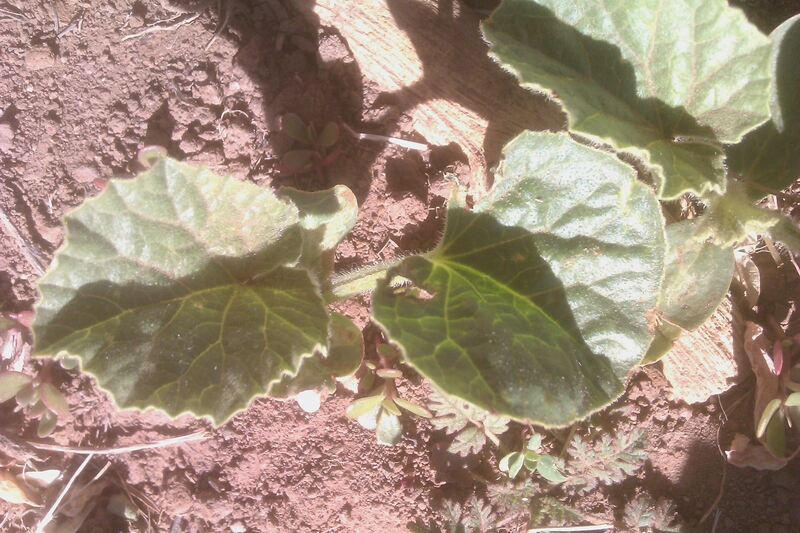 Then, even after having my garden rototilled in the spring before planting, little mystery sprouts started appearing. They mostly looked like some sort of squash, but some were a little different. 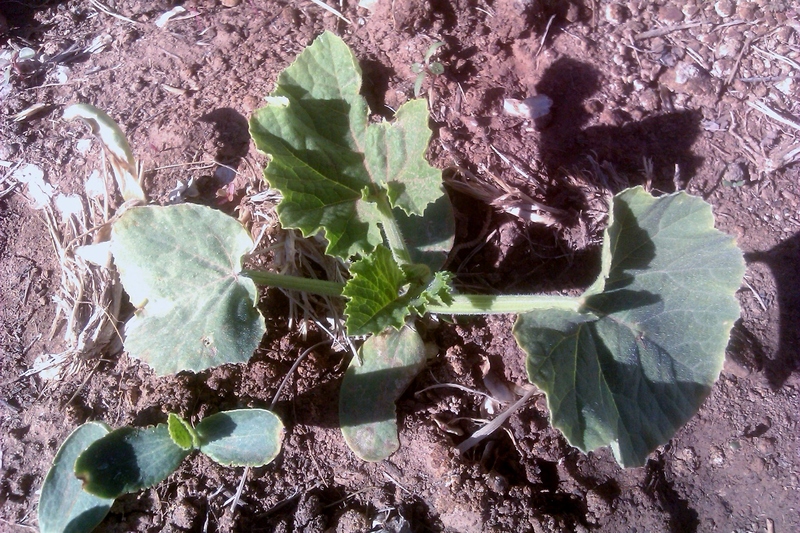 I asked friends who know things about gardens and they identified the seedlings as squash. I took photos and posted on Facebook asking for identification. Again, they said squash. Yep, some were squash: zucchini and pie pumpkins, it turns out. BUT, the other ones that looked a little different turned out to be cantaloupe. I didn’t have much faith that they would actually mature into edible fruit because our growing season here in SW Colorado at 6,900′ is fairly short and can be pretty cool. 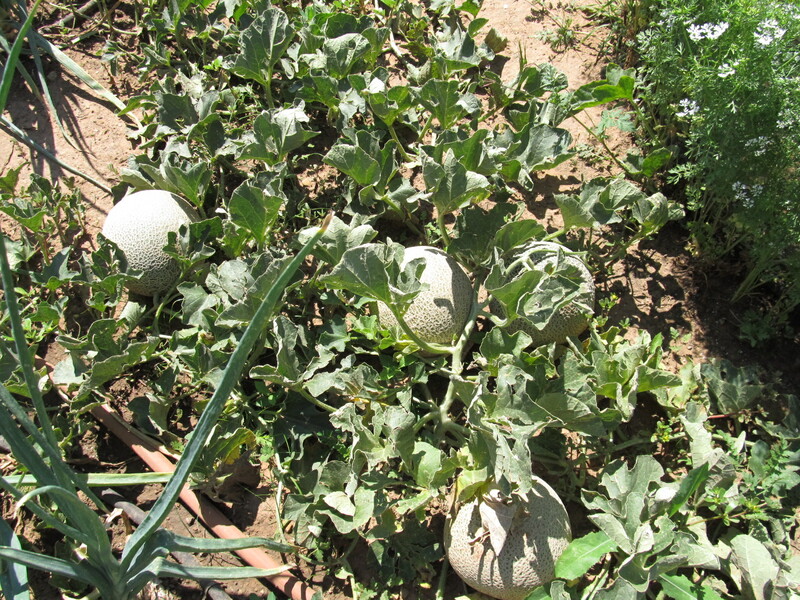 I tried growing melons many years ago and nothing ever materialized. I figured I’d let them try to grow and see what happened. I thinned them so they wouldn’t take over the whole garden if they really took off and I moved some to the far side of the garden (yes, I admit it, the rocky not-so-fertile side) to get them out of the way. I just watered them along with everything else, but generally ignored them, yet they prevailed! The vines spread out and grabbed onto the onions and tackled the cilantro and made pretty little orange flowers (another clue that they were not squash – different flowers). Then one day, there were little balls of melon hanging around out there. I was finally able to positively identify them as melon. I started feeling sorry for the poor things, still assuming they would never mature enough to get to go inside and be sliced up for a snack. I propped them up on rocks so they wouldn’t sit in the mud too much and I tried to redirect the vines so they would be more comfortable. That’s about it, though. 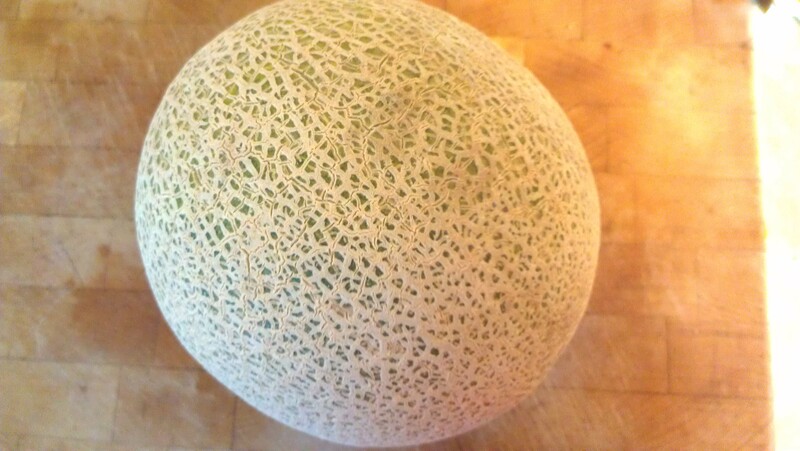 They started growing up and looking like actual cantaloupes and I thought, well…maybe they’re going to work out. I read up on when to harvest and watch for signs of ‘slip’ from the vine and a change from green to light brown color. Then a few weeks ago we had a really huge, long rainstorm. I don’t know how much moisture we actually got, but I certainly didn’t need to water for about a week – a rarity in our high, dry area. 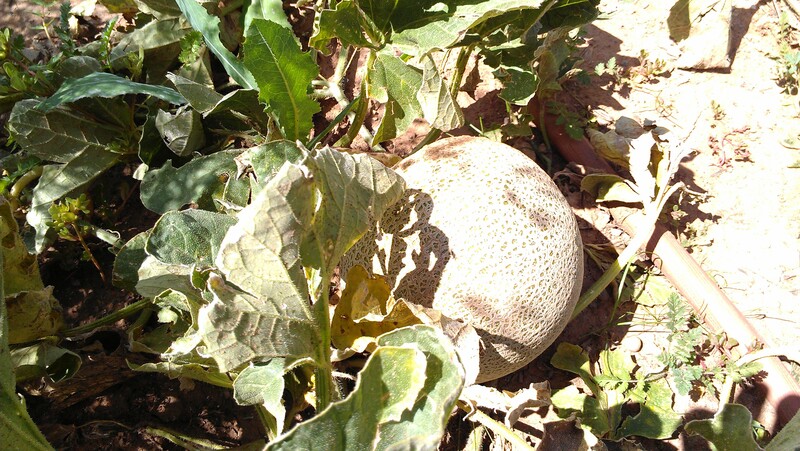 About a week later, I was rummaging around in the garden and noticed one of the big melons looked awful! It was all cracked and starting to rot and ants were feasting on it. YUCK! I grabbed a shovel and removed it from the area. I poked around at it and noticed the inside really looked like a cantaloupe. It was mostly pretty and orange. 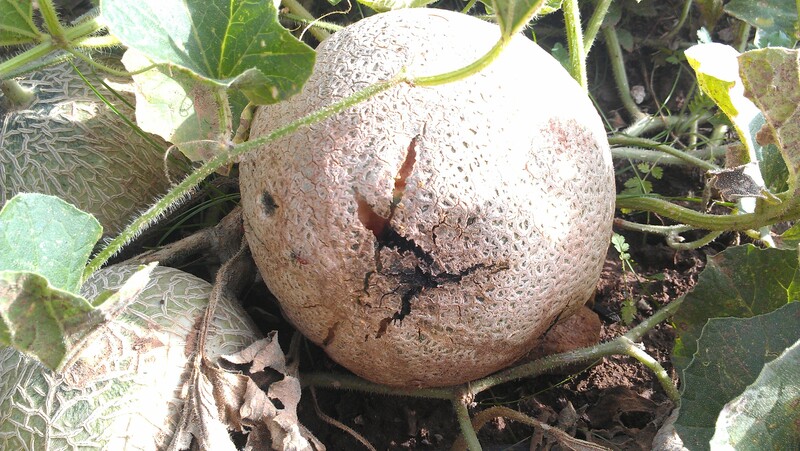 So, even though that one had rotted for some reason, I realized we had real hope for some good melons! I read some more and found that uneven watering can cause the cracking. I am pretty good about daily watering and I use soaker hoses, so I think it’s fairly even. I’m blaming the crazy rainstorm for the “uneven” water. While they still weren’t showing all of the signs of ripeness, I knew I had to keep a close eye on them, lest they crack and rot like their big brother. 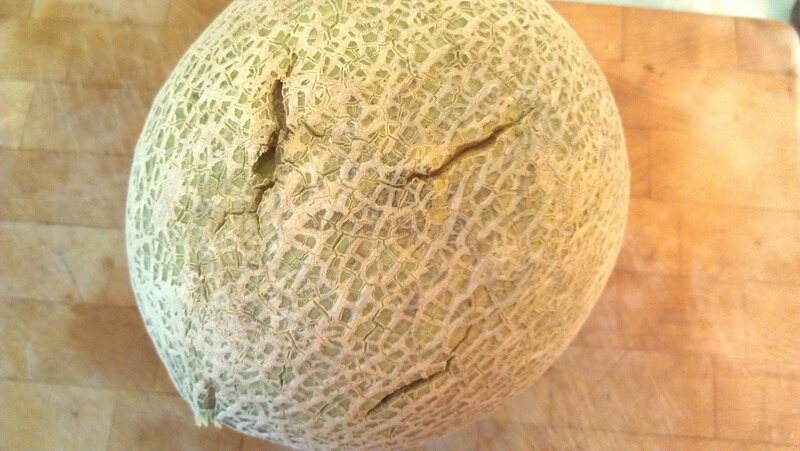 I started checking the big melons daily and as soon as I detected a crack, I cut the cord and brought them in. 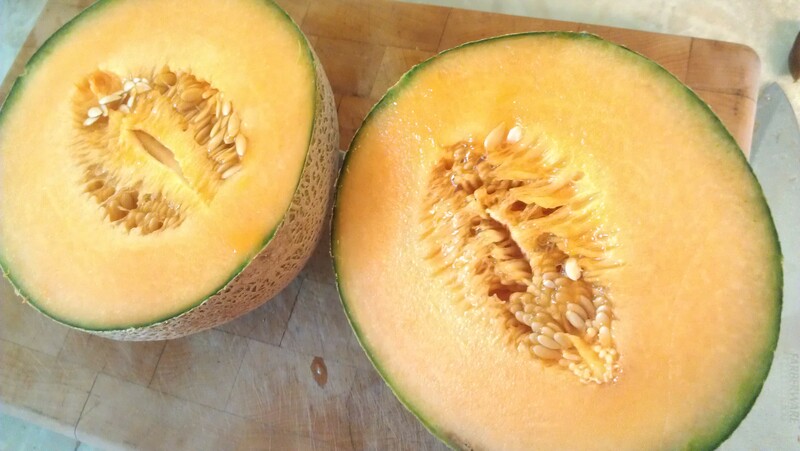 I had learned that melons will not ripen more after harvesting, so I wasn’t terribly convinced that they would taste good since they weren’t technically ripe. Turns out that I was wrong. Again. 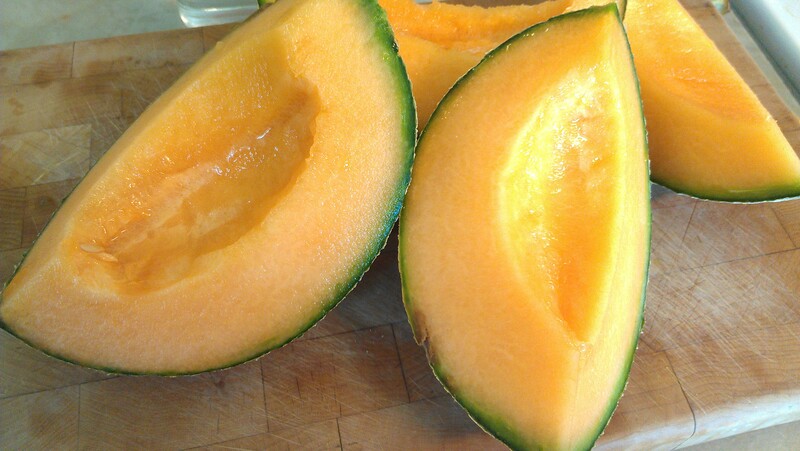 The first one I cut tasted sweet and ripe like the best summer melons from Green River, Utah. I enjoyed some, sliced the rest and put it in the fridge and forgot to tell the Hubs when he came in that night. Later he found it while foraging for a late-night snack. All sorts of excitement as he came to the bedroom where I was reading to tell me that the cantaloupe was amazing! He was totally impressed and couldn’t wait to tell his buddies at work – though he didn’t want to share. Who knew? The Hubs keeps telling me how impressed he is with my gardening skills, but I feel a little guilty since I really didn’t do much to help the melons grow. It’s like being the apathetic parent of a child prodigy. The Hubs says we (meaning I) have to do it again next year. How do you accidentally do something twice? I guess I throw some melon remains out in the dirt sometime this winter and see if we have a repeat. I have read that you’re not supposed to save seeds from grocery store food, so I’ll work harder at an organic accident next time around. So far we’ve eaten three full size melons and there are two more I’m keeping a close eye on outside. There are also several babies out there still. Not sure what will become of the poor underdeveloped orphans, but maybe they’ll be edible, if small. I’ll keep you posted! Leave a comment about your surprise garden successes. See my Gardening board on Pinterest for more garden notes. Categories: Fruit, Garden | Tags: Cantaloupe, Garden, gardening, Harvest, homegrown | Permalink. Aha! So that is what I was pulling out of my front perennial bed all summer. My happy accident, also beside the composter this year, was a ridiculously oversized acorn squash plant, from which I am now harvesting and will be for a while to come due to the prolific bounty of this independent upstart. Not as exotic as your lovely cantaloupes, but a delightful surprise. Thanks for that–my kids and I were just discussing the possibilities and the potential need for a few more dishes to use them in. That sauce looks sublime.